I am not a photographer – not even in a recreational sense. In fact, when I visit a garden or other landscape for the first time, I often choose not to take pictures because I find the activity of taking photographs too distracting. But photographs are an important media through which plants, gardens and landscape generally are known and appreciated (perhaps even constituted), so it is long past time for me to become more acquainted with some of the practices of garden and landscape photography. To this end (and some others, more complicated and less suited to discussion in a blog format), I decided to play around with the whole idea of ‘plant portraits‘ and see whether this might be a means of seeing an otherwise vilified plant species in aesthetic as opposed to political terms. 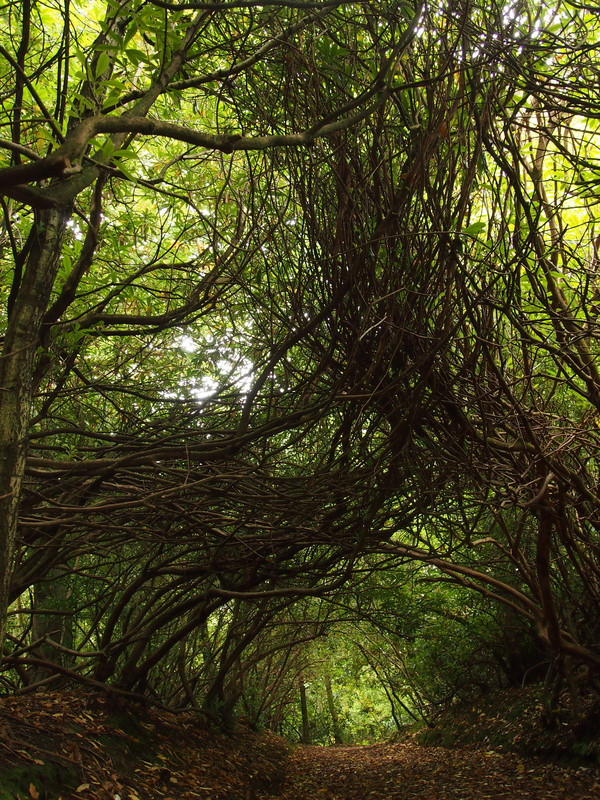 Of course, what I was interested in capturing, or at least the problem I was interested in exploring, was how to convey a sense of the plants’ belonging in the landscape despite being considered alien, or even fatal to that landscape. I’m not sure if I was successful in any sense. 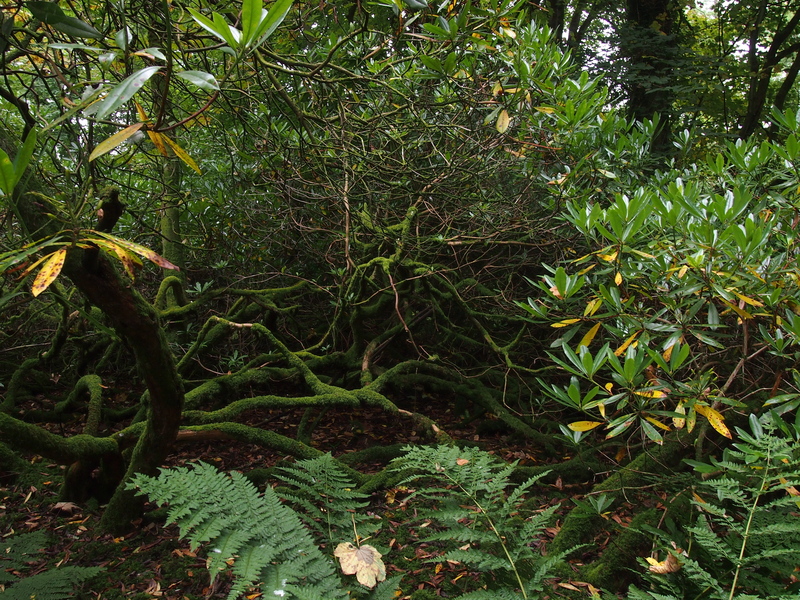 Not only are the photographs themselves nothing to get excited about, at the end of the exercise I felt a bit tired of rhododendrons. On the train ride home, the ones I saw beside the tracks seemed a bit ominous to me, as if having noticed them, I could now not get away from them. 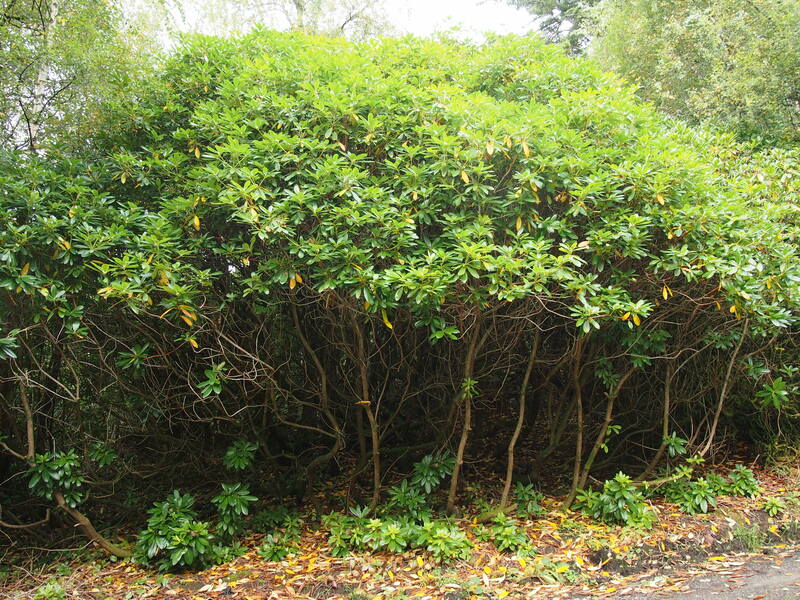 Rhododendron Ponticum is an introduced species in the UK, where it is widely considered invasive (i.e., “a killer of the countryside“). To my North American eyes, however, it is not yet categorically a bad guy. After years of pruning and caring for rhododendrons in Canadian gardens, I can still see beauty in their shiny foliage, and I am charmed by their lateral, sun-seeking growth habits. Putting aside technical questions (with respect to both the camera and my skills, both of which are somewhat lacking), I think it is interesting to note that this was a case where the right ‘portrait’ seemed to need a sense of the plants’ extensity: these plants have been working on this landscape (with some help from humans), for a really long time. This entry was posted in Uncategorized on September 27, 2013 by Erin Despard.